This was a gift from my friend Gonzalo. 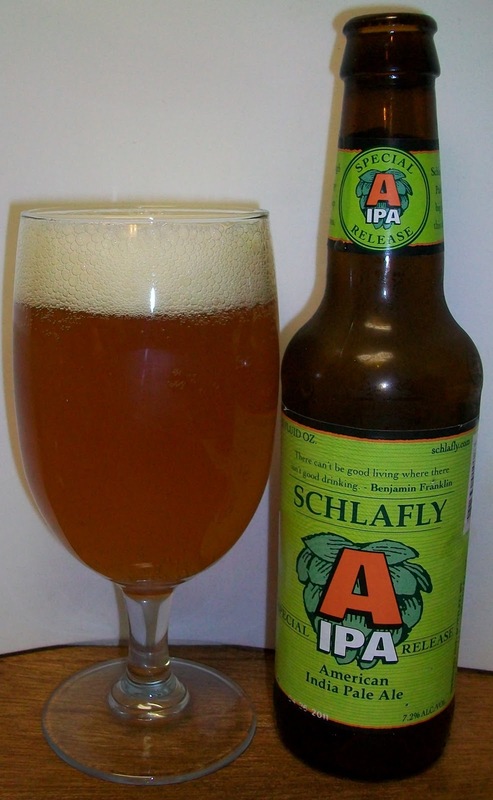 I have never had this beer from Schlafly so I’m really looking forward to this one. The beer pours a hazy light copper with orange hues and an off white head. The nose is pleasant with sweet malt aromas with citrus and floral hop aromas. That was a great first sip; clean crisp and refreshing with a nice hop complexity. We start out with pale malt sweetness up front. Then there’s a tingling effervescence over the tongue in the middle of the sip. There is also building hop robustness in mid-sip. The back end is fairly easy drinking with an almost effortless swallow. The finish very refreshing with light pale malts and a great hop finish. The hop flavors are mild for an American IPA but there is also an interesting complexity to it also. There is no wow factor here just a nice easy drinking and refreshing IPA. The pleasure of a simple beer, gotta love it. As the beer warmed the hops seemed to intensify a little. The finish is more like grapefruit in bitterness now. All and all this was a very nice American IPA. Sorry for the short review, I obviously did more drinking then writing on this one. I’m going or a B+ on this American IPA. This is a very refreshing American IPA with a nice malt balance. Still favoring the hops as an IPA should be there was a definite malt backbone to this beer.